Peter Hearsey's "Spirit of Langhorne"
We commisioned world renown artist Peter Hearsey for this important project. He painted beautiful pieces of artwork which we combined into a signed and numbered limited edition artwork. We only have 546 prints to sell. One for every month Langhorne Speedway was in existence. From May, 1926 through October, 1971. We will have a Certificate of Authenticity with each print. You can ask for a special number, but please have several numbers because your number maybe already sold. You will find flagman, Doc Gerner; Jimmy Bryan in the Dean Van Lines Special; first race winner Fred Winnai and the last race winner Roger Treichler; first pavement winner Jim McElreath; motorcyle legend Ed Kretz; A.J. Foyt in A.J. 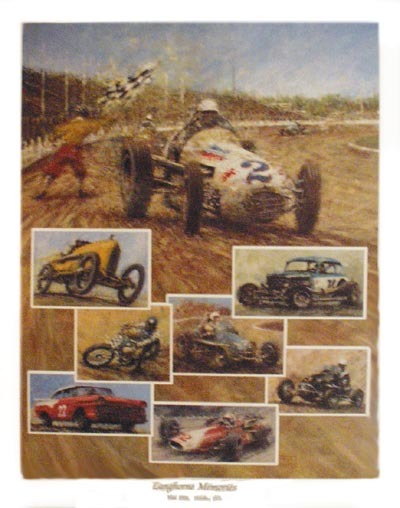 Watson's sprint car; Bill Schlinder in the trey Caruso midget; Fireball Roberts winning in a stock car. Image Size: 16" x 20 1/2"